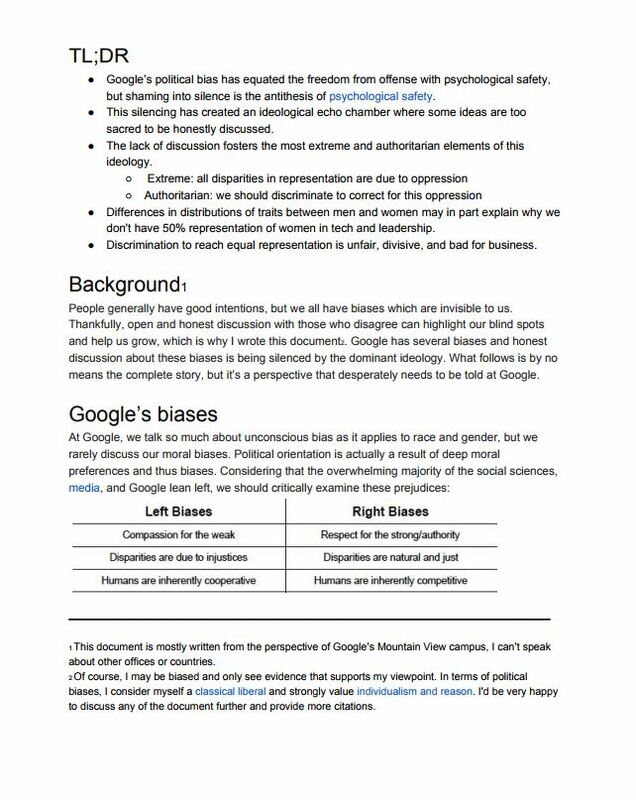 A Google engineer writes a 10-page memo, which in large part complains that Google is an ideological echo chamber, which is hostile to those like him on the right (he describes himself as a classical liberal) who don’t share left-wing beliefs. 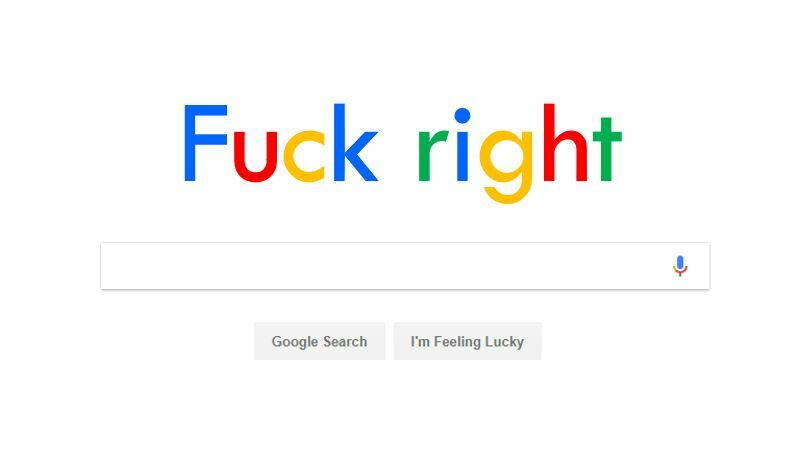 Google proceeds to fire him, thus proving his point. Discussion is impossible when one set of ideas is considered to be right and all others are beyond pale, even if they are shared by the majority of the population and a large chunk of relevant scientific literature. I mean specifically the engineer’s arguments that biological differences and not just sexism, bias and discrimination might explain why women are underrepresented in IT, and why affirmative action is a blunt weapon to achieve diversity. And so Google keeps striving to have the most diverse workforce who all think exactly the same. Google, fortunately, can count on the mainstream media to misrepresent and misreport the contents of the memo. “A Google engineer said women might be genetically unsuited for tech jobs”, laments Washington Post. CNN goes one better (“argued women aren’t biologically fit for tech jobs”). 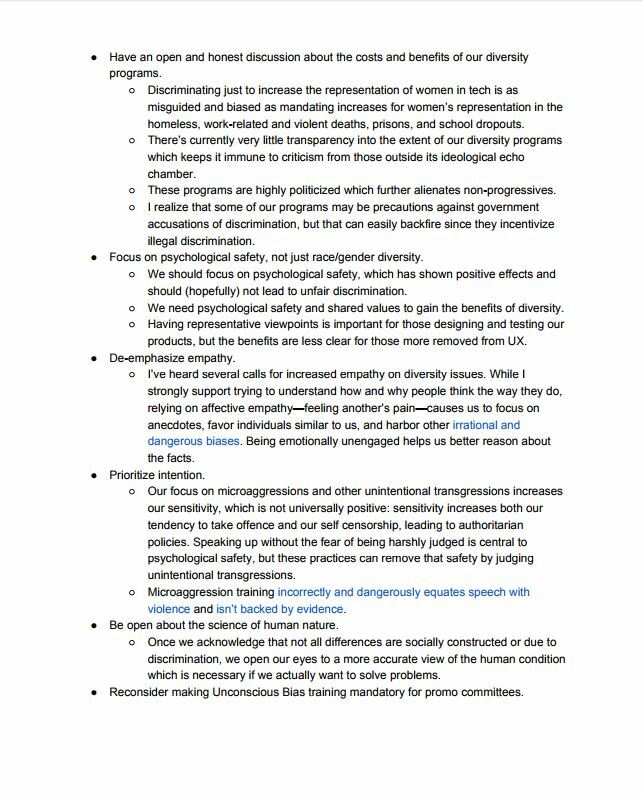 Others (Time, Forbes, ABC News) characterise the memo as “anti-diversity”. 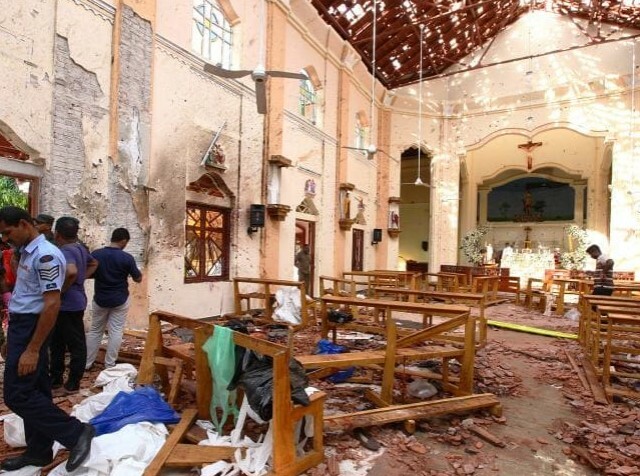 I don’t know if the media outlets have read the document and are lying about its contents, or haven’t bothered to read it and are lying about its contents. Is the media dishonest or lazy or both? 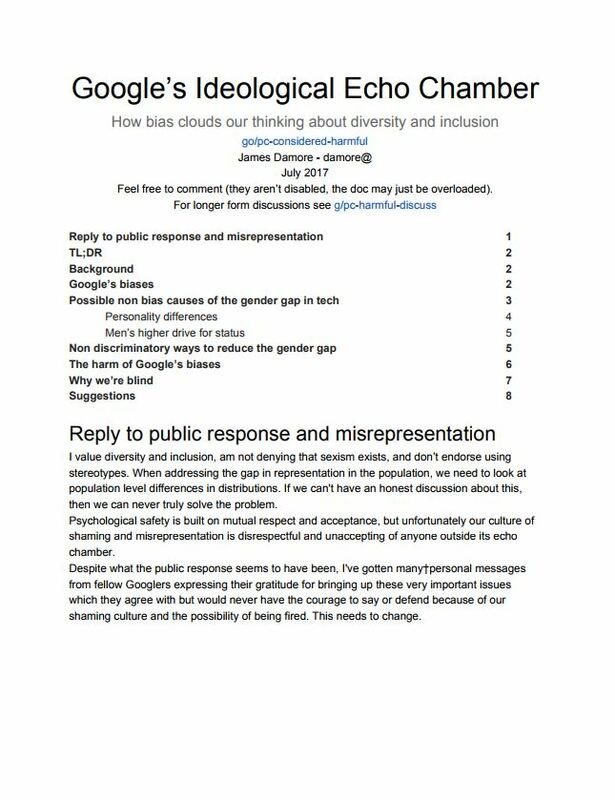 I hope it’s clear that I’m not saying that diversity is bad, that Google or society is 100% fair, that we shouldn’t try to correct for existing biases, or that minorities have the same experience of those in the majority. 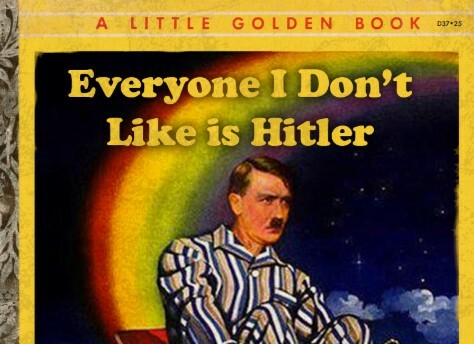 My larger point is that we have an intolerance for ideas and evidence that don’t fit a certain ideology. I’m also not saying that we should restrict people to certain gender roles; I’m advocating for quite the opposite: treat people as individuals, not as just another member of their group (tribalism). 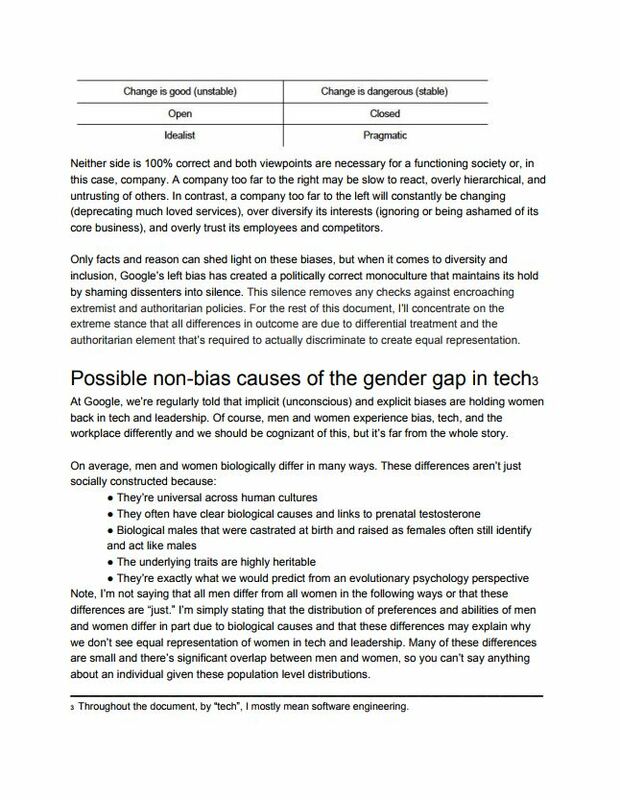 I’m not saying that all men differ from all women in the following ways or that these differences are “just.” I’m simply stating that the distribution of preferences and abilities of men and women differ in part due to biological causes and that these differences may explain why we don’t see equal representation of women in tech and leadership. 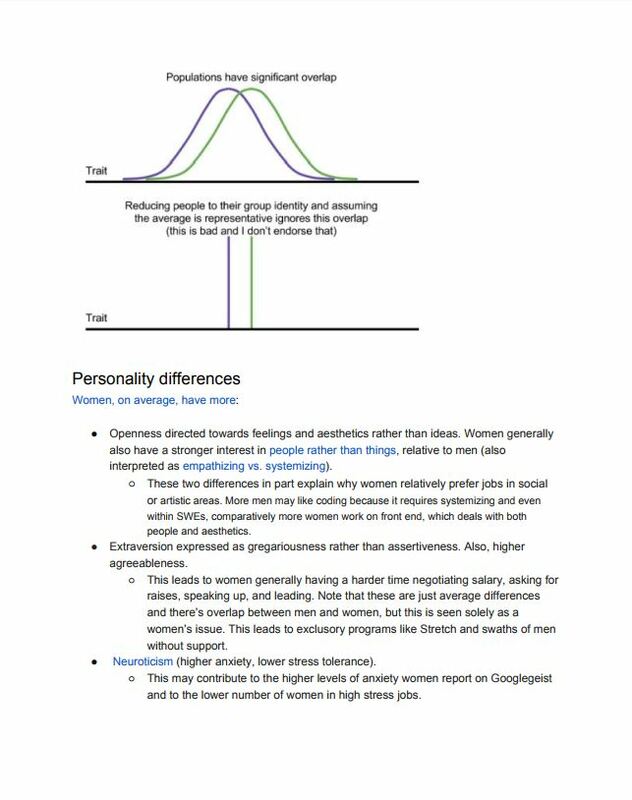 Many of these differences are small and there’s significant overlap between men and women, so you can’t say anything about an individual given these population level distributions. 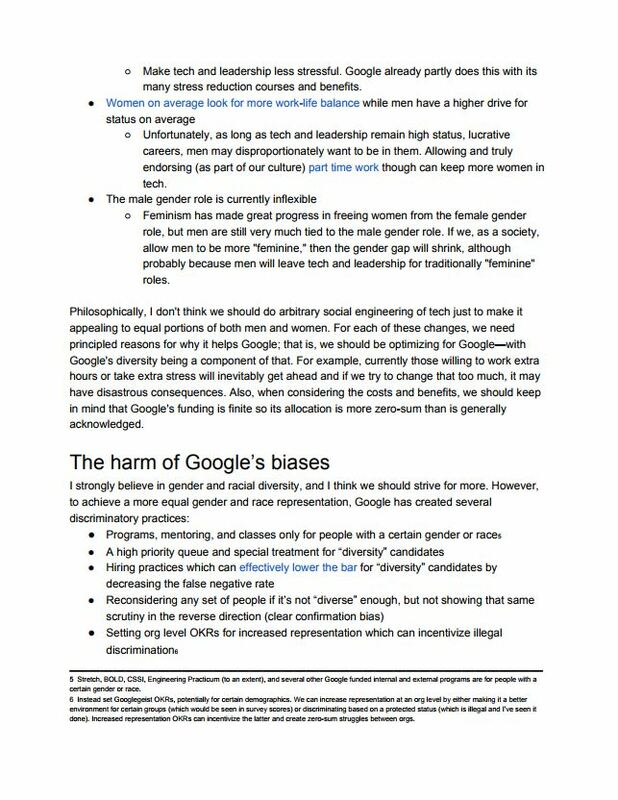 Damore got fired, in part, for “perpetuating gender stereotypes”. In fact, he is merely pointing to facts, attested by much academic research, that men and women are not the same, and there are – in general – differences, with some characteristics being more prevalent in one gender than the other. But by all means Google, be science deniers. 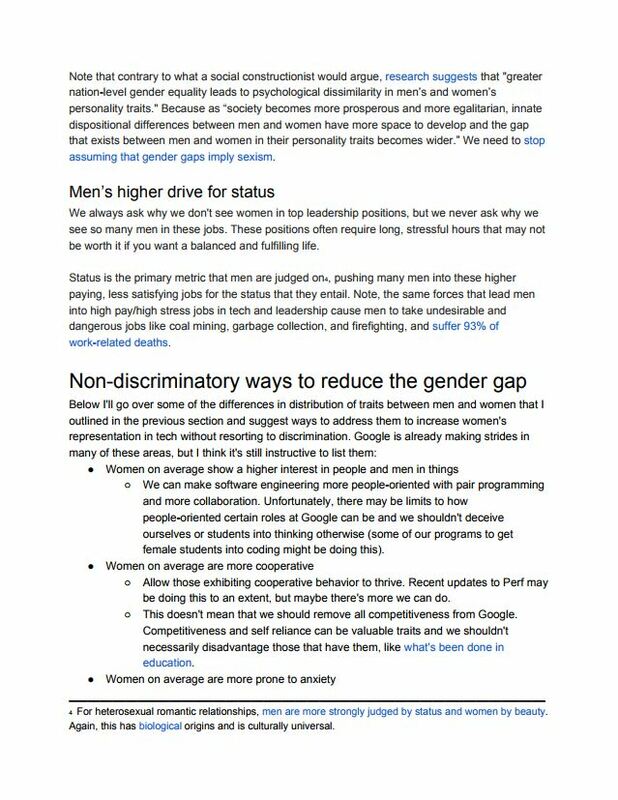 What Damore actually argues is that if we want to see more women work in IT there are better ways of achieving it than preferential treatment and affirmative action; ways that take account of some of the differences he identified and work to get around these potential invisible barriers. This controversy is worrying because Google is not some small-town copy paper distribution company but a technological giant of a quasi-public utility status, which helps to determine how we use the Internet, what we search for and what we find, which news we read, and has fingers in numerous other technological pies that impact on our lives and work. 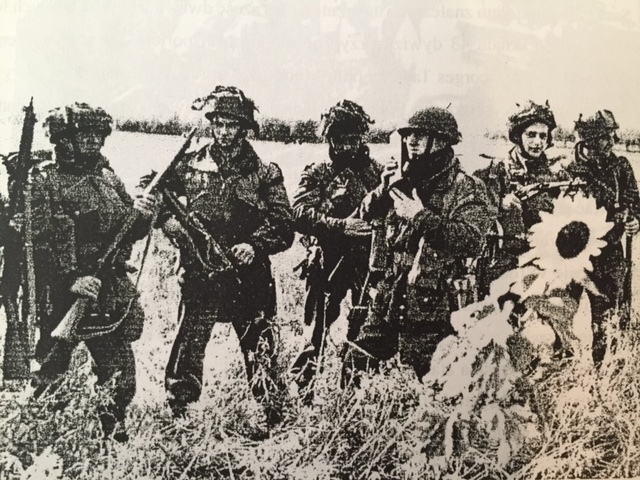 If it is indeed a mono-ideological echo chamber in the way it works inside – as it appears to be – how can we trust it to be objective and unbiased in the services it provides? 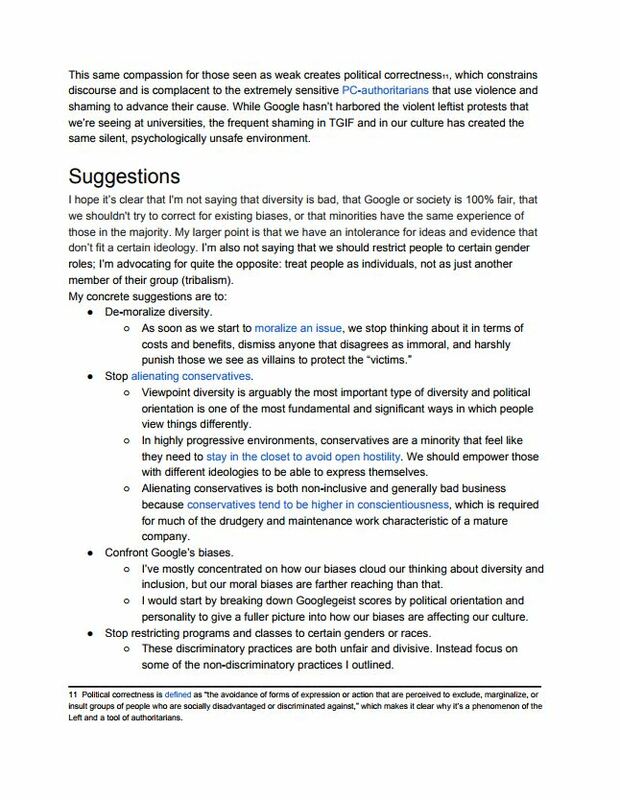 Damore, after all, is not a white supremacist Nazi or a communist (though I strongly suspect that the latter would be quite OK at Google as it is elsewhere in the enlightened society); the political views he holds are more or less shared by half the general population and therefore Google users (at least in the United States), and his views on biological and bio-chemical gender differences as well as efficacy of affirmative action are likewise shared by anywhere from large minorities to majorities, depending which particular issue or problem is concerned. 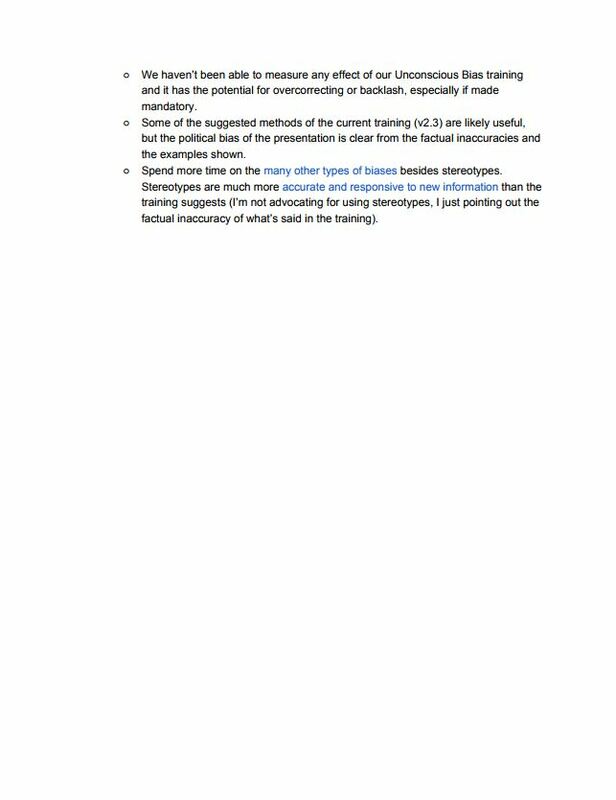 The “nature versus nurture” (or biology versus environment) debate has certainly been the biggest debate in social sciences for almost a century now, and to pretend that it doesn’t exist or that it has been settled or that one side of it has been discredited as much as flat earth or phrenology does not inspire confidence in the supposedly apolitical, innovative and science-based institution that apparently holds such views. Girls indeed can do anything, as the popular slogan holds. 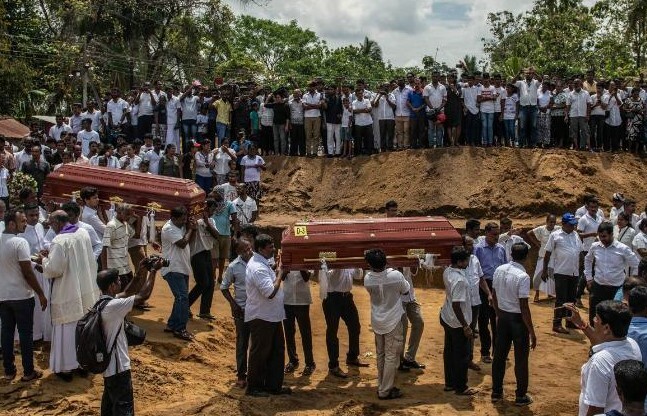 But it’s a different question whether they all want to do anything, as is the question whether every societal institution or business should demographically mirror the society at large, and if so, how to best achieve that end. But if you’re concerned that women don’t make at least 50 per cent of software engineers or company CEOs but not that they don’t make up 50 per cent of miners or garbage collectors, or not that men make up nowhere near half teachers or nurses, then you open yourself to charges of selectiveness and hypocrisy. 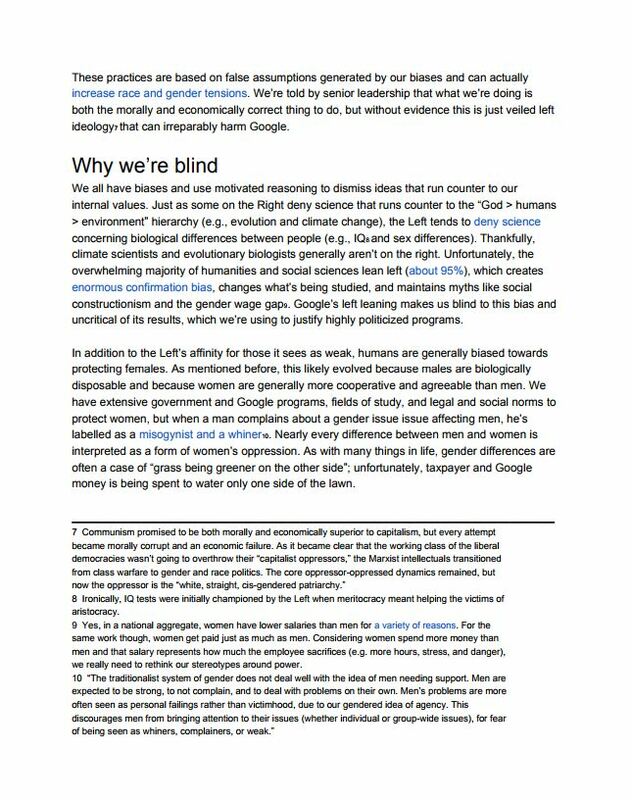 Anyway, judge for yourself how terrible and sackable was what Damore has written. And next time Google preaches “Don’t Be Evil”, maybe you will be inclined to tell them “But Don’t Be Stupid Either”.